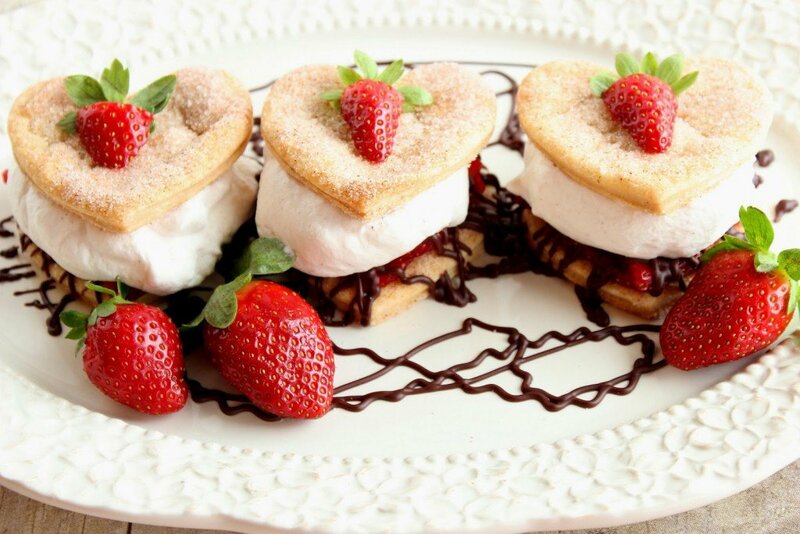 Deconstructed Strawberry Pie with Cinnamon Whipped Cream & Chocolate Ganache may look difficult to make, but they only take moments with the help of store-bought pie crust. Sometimes ideas for recipes keep me awake at night. 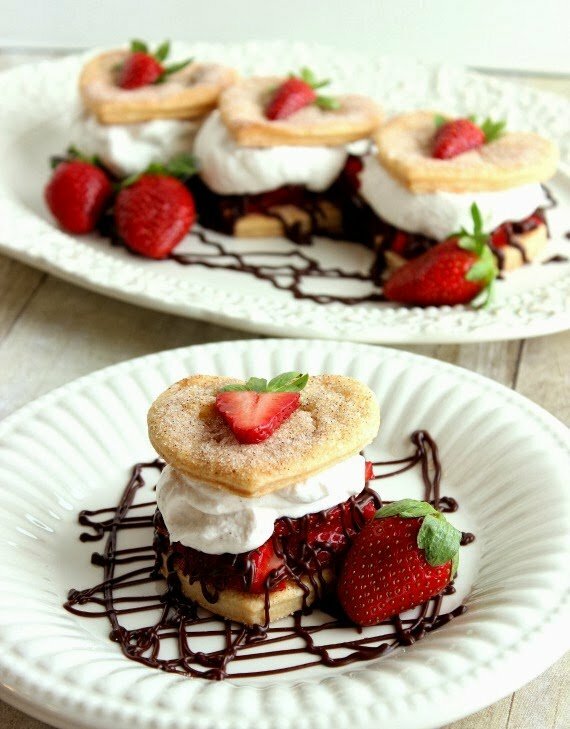 If I didn’t think the sound of my stand mixer whipping up cinnamon whipped cream would bother my family in the middle of the night, I probably would have been baking and assembling these Deconstructed Strawberry Pie with Cinnamon Whipped Cream & Chocolate Ganache at 2:00 in the morning. I came up with the idea for making Deconstructed Strawberry Pie when the call went out for a monthly recipe and photo competition called 1,2,3 Cook and Snap, which is run and hosted by The Foodie Blogroll. 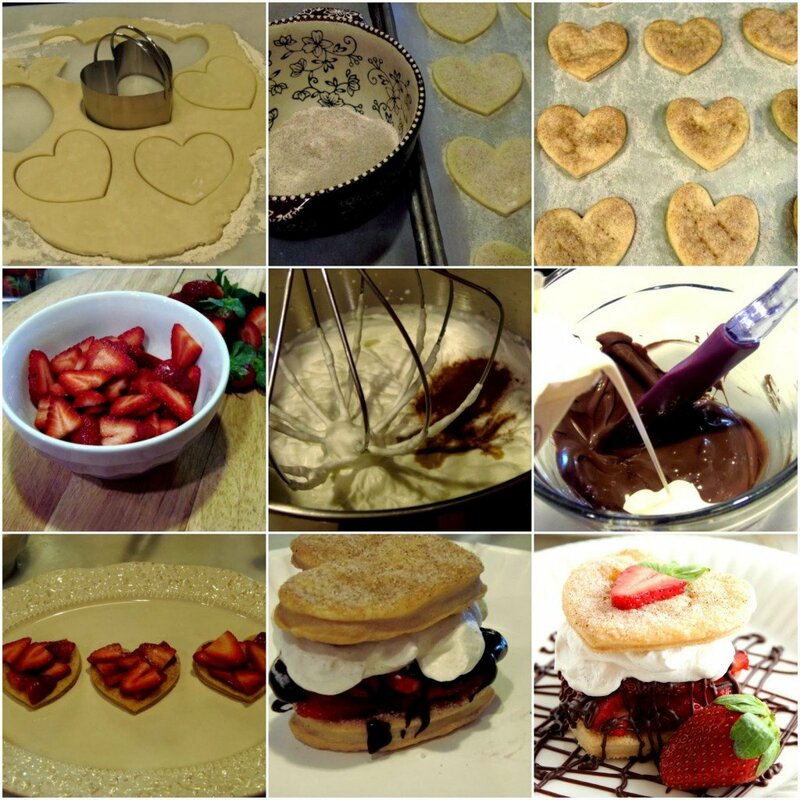 Naturally, February’s theme is Valentine’s Day and the three ingredients that must be used in this month’s submission are strawberries, chocolate, and cinnamon. When I think of cinnamon, my mind always goes to a little something my mom used to make called crust pie. I believe the idea was handed down to her from my grandma, her mother-in-law. The idea for crust pie is simple. Sprinkle the scraps of dough that you have left over when rolling out pie crust with cinnamon and sugar and bake them until crispy. Those flaky little crust pie morsels are almost better than the pie themselves, and I fondly remember crust pie being one of my dad’s absolute favorite things to munch on. My inspiration for Deconstructed Strawberry Pie with Cinnamon Whipped Cream & Chocolate Ganache are my mom, dad, and my dad’s mom, my grandma. 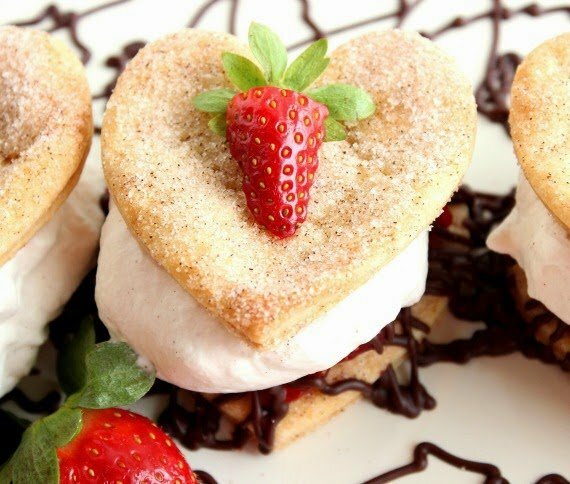 Seems like a fitting tribute for Valentine’s Day and I’d like to dedicate this recipe to the three of them! Place the cut pie crusts onto a parchment lined baking sheet and pierce each pie crust a couple of times with the tines of a fork. In a small bowl, stir together the granulated sugar and cinnamon. Sprinkle each pie crust liberally with the sugar/cinnamon mixture. Bake the crust pie shapes in a preheated oven for 17-20 minutes or until they’re crispy and lightly browned. Cool. Place the metal bowl and whip of a stand mixer in the fridge to cool while you prepare the crust pie. *Note – the cold bowl and whip will make it easier and faster to whip the cream. In the chilled bowl of a stand mixer, whip the 1 pint heavy cream on high speed until stiff peaks start to form (approximately 3-4 minutes) *Note – start whipping the cream on low and gradually increase the speed to high. Keep chilled until ready to assemble. In a small microwave-safe bowl, microwave the chocolate morsels on 50% power until melted (stirring occasionally). Stir in the heavy cream until smooth and glossy. Set aside. Place the crust pies, cinnamon/sugar side up, on a plate or tray. Layer some of the thinly sliced strawberries onto the crusts. Drizzle the strawberries liberally with the chocolate ganache. 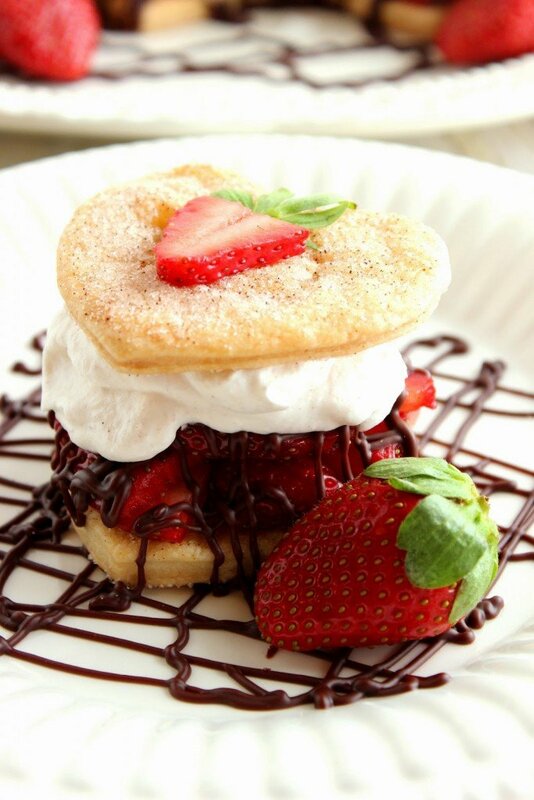 Top the strawberries and ganache with a healthy dollop of cinnamon whipped cream. Top the cinnamon whipped cream with the final crust pie top, cinnamon sugar side up. Serve and enjoy! 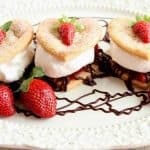 I hope you’ve enjoyed this recipe for Deconstructed Strawberry Pie with Cinnamon Whipped Cream & Chocolate Ganache much as I’ve enjoyed bringing it to you! 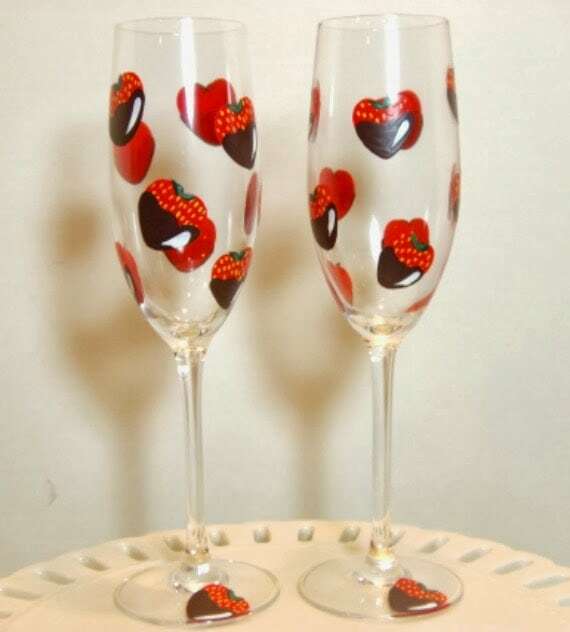 To coordinate with this recipe for Deconstructed Strawberry Pie I’ve chosen this pair of chocolate covered strawberry champagne flutes. If you ask me a nice glass of champagne would be the perfect accompaniment to this lovely dessert. Cheers to that! Should you have any questions regarding this recipe for Deconstructed Strawberry Pie, or anything else you’ve seen on my site, please don’t hesitate to contact me directly, or leave me a comment in the comment section below. It is always my distinct pleasure to get back to you with a reply just as soon as I possibly can! Sometimes good things keep me awake at night too, Paula 🙂 Thanks! I´ll do it this Valentine´s day thanks for the idea! My pleasure, Evy. I do hope you’ll try them and let me know what you think.